We recommend that you either print a copy of these terms and conditions or save them to your computer for future reference. We may amend these terms and conditions from time to time and so you should check the website each time you wish to place an order to ensure you have seen the terms which will apply to that order. 1.1 This website and our online shop are operated by Bunzl UK Limited (company number 02902454). Our registered office is at York House, 45 Seymour Street, London W1H 7JT United Kingdom. Our VAT number is 823820932. 1.2 Greenham is part of the Bunzl PLC group of companies. 3.1 The images of the products in our online shop are illustrative only. For example, although we have made every effort to display colours accurately, we cannot guarantee that your computer's display of colours accurately reflects the colour of the products. Products may, therefore, vary slightly from the images on the website. 3.2.2 we only supply the products for domestic use. 3.3 Please be aware that some products have manufacturer's specifications, brochures and/or safety guides which in each case dealing with the correct use and application of the relevant product. Such specifications, brochures and/or safety guides are produced by the manufacturer and are, to the best of our knowledge, correct at the point at which they were first supplied to us. However, such specifications, brochures and/or safety guides may be subject to change from time to time. 3.4 You are responsible for selecting products that are suitable for the purpose you require and for using the products in accordance with any relevant	manufacturer's specifications, brochures and/or safety guides and are advised to check such specifications before placing an order for products. 4.1 All products shown are subject to availability. If the item you have ordered is not available we will inform you by e-mail as soon as possible and we will not process your order further unless you wish us to. 4.2 For the steps you need to take to place an order in our online shop, please see our How To Shop Online page. 4.3 You can review your order during the order process and have the opportunity to modify it before submitting the order. You are responsible for ensuring the accuracy of each order you submit so please do take the time to check your order at this stage of the process. If you submit an order in error you will have the opportunity to cancel this as detailed below. 4.4 Before placing your order, you will be asked to tick the box provided if you accept these terms and conditions. If you do not accept these terms and conditions, you will not be able to order products from our online shop. 4.5 Once you have placed an order, you will receive an e-mail from us acknowledging that we have received your order. However, please note that this does not mean that your order has been accepted. 4.6 Orders placed on Saturdays or Sundays or on any public holiday will not be acknowledged until the next business day in the UK. 4.7.2 we have agreed to accept your order before payment is made. 4.9 The contract for the sale and purchase of the products ordered by you will only be formed and become binding when we send you this dispatch confirmation email. The contract that is formed will include these terms and conditions. 4.10 Please note that the contract formed between you and us and all communications arising out of it shall be in the English language. 4.11 If we are unable to supply you with a product, for example, because that product is not in stock or available or due to a pricing error on our online shop, we will notify you of this by e-mail and we will not process your order. If you have already paid for the product or products, we will refund you the full amount as soon as possible and in any event within 14 days of the date of your order. 4.12 If you are purchasing products for business purposes, you confirm that you have authority to bind any business on whose behalf you are ordering the products. 5.1 The prices of the products will be as shown on our online shop. All our prices are shown in British Pounds Sterling (GBP) and are either inclusive of the VAT or the amount of VAT payable is separately shown but must be added. 5.2 If the rate of VAT changes between the date of your order and the date of delivery, we will adjust the VAT you pay, unless you have already paid for the products in full before the change in VAT takes effect. 5.3 Prices may change and offers may be withdrawn at any time but this will not affect any order which we have accepted by sending the dispatch confirmation email. 5.4 All online orders incur no delivery charge. All other orders that were placed other than via our online shop will incur a handling charge of £4.95 on orders below £30. 5.5.2 if the correct price of the product is higher than the price stated on our online shop, we do not have to provide the products to you at the incorrect (lower) price. In these circumstances, we will contact you by email as soon as possible to inform you of this error. You will then have the option to cancel the order and receive a full refund if you have already paid the stated price to us or to continue to purchase the product and pay the correct price. We will not process your order until we have your instructions. If we are unable to contact you using the contact details you provided during the order process, we will treat the order as canceled and notify you in writing to this effect. 6.1 We may offer promotions and discounts from time to time, with or without a promotion code. Promotions with codes are usually only valid for one transaction and once the code is used it will be deactivated and will be no longer valid. 6.2 Promotions cannot be added to an order once you have submitted the order to us, therefore you must ensure that any promotional code is registered before you place an order. 6.3 We do not take responsibility for, nor are we obliged to honour, promotion codes or promotions published on third party websites. 6.4 We reserve the right to withdraw a promotion or promotional code at any time. 7.1 If you are purchasing products as a consumer, you can only pay for products using a debit or credit card and your card will be debited for all relevant charges, at the same time as we accept your order before the products ordered are dispatched. 7.2 If you are purchasing products for business purposes, you can pay for products by debit or credit card or, if your business has an active trading account registered with us, on the account. For more information about setting up a trading account, please click here or call us on 0208 560 1244. 7.3 We accept the following cards: Visa, MasterCard & American Express. 8.1 Details of your legal right to cancel under the Contracts (Information, Cancellation and Additional Charges) Regulations 2013 and an explanation of how to exercise it are set out in this clause 8 and are also provided in the dispatch confirmation email. 8.2 Except as provided in clause 8.4, you have the right to cancel any order you place with us within 14 days from the date that you (or any person identified by you in your order) receive the products ordered without the need to provide a reason. Outside of this 14 day period, you do not have the right to return the products unless they are faulty (in which case clause 16 shall apply) or you have obtained our prior written consent to return the products, (in which case clause 9 shall apply). 8.3 Where your order consists of multiple products which are being delivered to you on different days then your right to cancel the order expires 14 days from the date on which you received the last of the products ordered. After this period your right to cancel expires. 8.4.4 any products which have been mixed inseparably with other items by you after delivery. • you may use our Cancellation Form a copy of which can be downloaded at Cancellation Form. 8.6 You may wish to keep a copy of your cancellation notification for your own records. If you send us your cancellation notice by e-mail or by post, then your cancellation is effective from the date you sent us the e-mail or posted the letter to us. 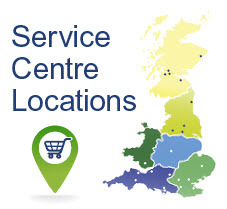 8.7.2 return the products in person together with the completed Cancellation Form to your local Service Centre Service Centres Address List within 14 days from the date you received the products. 8.8 We suggest that products are sent by registered post with your local post office or by courier so that you can track the items and that you always retain evidence of posting and the tracking number until the purchase price has been refunded. 8.11 You have a legal obligation to take reasonable care of the items while they are in your possession and are responsible for the risk of damage during transport. If on inspection of the returned products we believe that they have been damaged or their value have been diminished as a result	of your handling of the products beyond what would have been necessary to establish the nature, characteristics and functioning of the products or if the products have been damaged in transit then we may deduct an amount equal to the damage or diminishment in value from the refund owed to you. (c) if you are not yet in receipt of the items, 14 days after the date on which you have informed us that you wish to cancel. 8.13 We will make the refund using the same means of payment as you used for the initial transaction, unless we have expressly agreed otherwise. In any event, you will not be charged by us as a result of the reimbursement. (b) pay an administrative handling charge for the return which charge shall be a sum equal to 20% of the invoice value of the products being returned. 10.1 If you are purchasing products as a consumer, we are legally required to supply products which conform to our contract with you. As a consumer, you will always have legal rights in relation to products that are faulty or not as described. These legal rights are not affected by the returns policy in these terms and conditions. Further advice can be obtained from your local Citizens' Advice Bureau. 11.1 It is our normal practice to replace any product which, on delivery to you, is not in a usable condition. No handling charge will be made in these circumstances. However, before offering such replacement, we may require you to return the product to us (at your own expense) for examination so we can determine whether the product is genuinely not usable. If requested by us to return the product for examination, you should ensure the product is thoroughly cleaned and adequately packed before sending it to us. 12.1 We will try to send you your order by the estimated delivery date set out in the dispatch confirmation email and in any event no later than 30 days following the date we accepted your order under these terms and conditions unless we are prevented from doing so by any event outside of our reasonable control (as described in clause 20 below). If we are unable to meet the estimated delivery date we will contact you with a revised estimated delivery date. The estimated delivery date will normally be within 30 days of our dispatch confirmation email, but it may be longer, especially for bespoke products. 12.2 Delivery will be completed when we deliver the products to the delivery address you gave us when placing your order. 12.3 If no one is available to take delivery at the delivery address you have given us, you will be notified by us or the carrier, in which case please contact our carrier to re-arrange delivery. 13.1 You are responsible for loss or damage to products you have ordered on delivery of those products to the delivery address you gave us. 13.2 However, you will not own the products until we have received your payment in full for the products, including all applicable handling charges and full payment of all other amounts owed by you to us in respect of any other orders for products between you and us. 14.1 Risk of loss or damage to the products shall pass to you at the time of delivery of the products to the delivery address you gave us. 14.2 We will still own the products outright, regardless of delivery, until you have paid us in full for those products and the VAT thereon, and all other sums due from you to us at that time and it is at this point that ownership will transfer to you. We may attribute money received from you as being payment for any products supplied by us as we think fit, regardless of the circumstances. 14.3.3 may not otherwise deal with, pledge, encumber, sell or dispose of those products. 14.4 If you become insolvent, unable to pay debts, cease to trade, have a receiver appointed over any of your assets, have an administrator appointed, enter into any composition with creditors generally, or are wound up ("Insolvency Events") or any step is taken towards any of the Insolvency Events or if you are overdue in any payment due, all sums shall become immediately due and payable and we may, by immediate notice to you, terminate your right (if still subsisting) to use or resell the products still owned by us, terminate the contract between you and us for the products, suspend or cancel any deliveries, and we shall be entitled upon demand to the immediate recovery of all those products. You irrevocably give us authority to enter any place to recover those products. Such recovery shall not cancel your obligation to pay the price for those products, provided that we shall make a fair allowance for the value of any products which we have recovered. 15.1 We only deliver to addresses outside the UK where the value of the order exceeds £1,000. 15.2 If you order products from our online shop for delivery outside the UK, your order may be subject to additional import duties and taxes which are applied when the delivery reaches that destination. These must be confirmed by you as we have no control over these charges and cannot predict their amount. 15.3 You will be responsible for payment of any applicable import duties and taxes and you should contact your local customs office for further information before placing your order. 16.1 We provide a warranty that on delivery and for period of 1 month from delivery, the products shall be free from material defects ("warranty period"). 16.2 If during this warranty period there is any material breach of clause 16.1, then you must notify us promptly and we will, at our option, repair or replace the relevant product (or any defective part) or offer a refund of all or a fair and reasonable part of the price paid for the relevant item once you have returned the item to us. Provided we comply with this clause 16.2, we shall have no further liability in respect of the products (except for any rights you may have as a consumer, if relevant). 16.3.5 any specification provided by you. 16.4 Where you are purchasing the products as a consumer, the warranty described above is in addition to your legal rights in relation to products that are faulty or not as described. 18.1 We are responsible for loss or damage you suffer that is a foreseeable result of our breach of these terms and conditions or our negligence, but we are not responsible for any loss or damage that is not foreseeable. Loss or damage is foreseeable if it is an obvious consequence of our breach or if it was contemplated by you and us at the time we accepted your order. 18.2 We only supply the products to consumers for domestic and private use. You agree not to use the product for any commercial or business purposes, and we have no liability to you for any loss of profit, loss of business, business interruption, or loss of business opportunity. 18.3 We do not in any way exclude or limit our liability for death or personal injury caused by our negligence, fraud or fraudulent misrepresentation or for any breach of any terms implied by law. 19.1 Any claims for non-delivery of products which you have ordered must be made in writing to us within 10 days of the estimated date of delivery shown on the dispatch confirmation email. 19.2 Any claims for shortages in deliveries or damage to products must be made in writing to us within 3 days of receipt by you of the products. 19.3 We shall only be liable to you in respect of claims notified to us in accordance with these terms and in particular clauses 19.1 and 19.2 above. 19.4 Our liability for any claims arising out of or in connection with a contract, the products, any delay or failure to supply the products, any defects in the products or in any other way related to the products or our contract concerning the products, however arising shall be limited in respect of all claims in aggregate to a sum equal to the price paid (exclusive of VAT) by you for the affected products under the individual contract. 19.5.3 claim arising out of a claim against you or your business by a third party. 19.6 You agree that each of the sub-clauses in clause 19.5 and each of the sub-paragraphs 19.5.119.5.1(a) to 19.5.1(k) in sub-clause 19.5.1 constitute separate terms and the introductory wording of clause 19.5 shall be applied to each of them separately. If there is any claim or finding that any such individual sub-clause or sub-paragraph is unenforceable for any reason, such unenforceability shall not affect any other provision within clause 19.5 or otherwise. 19.7 The term "however arising" when used or referred to in clause 19 covers all causes and actions giving rise to the liability on our part arising out of or in connection with the products, any delay or failure to supply the products, any defects in the products or in any other way related to the products or our contract concerning the products including (i)	whether arising by reason of any misrepresentation, negligence, breach of statutory duty, other tort, repudiation, renunciation or other breach of contract, restitution or otherwise; or (ii) whether caused by any total or partial failure or delay in supply of the products or defective products. 19.8.4 to the extent prohibited by the Consumer Protection Act 1987. 19.9 These terms, together with those in any document referred to, constitute the entire agreement and understanding between you and us and supersede any previous agreement or understanding we may have regarding each contract. 19.10.2 the only remedy available to you for breach of any statement, representation or other term that is expressly set out in these terms (or other documents referred to) shall be for breach of contract under the terms of the relevant contract. 20.1 We will not be liable or responsible for any failure to perform, or delay in performance of, any of our obligations under these terms and conditions that is caused by an event outside our reasonable control for example failures by third parties to supply us with products, strikes, or other industrial action by third parties, civil commotion, riot, invasion, terrorist attack or threat of terrorist attack, war (whether declared or not) or threat or preparation for war, fire, explosion, storm, flood, earthquake, subsidence, epidemic or other natural disaster, or failure of public or private telecommunications networks or transport methods including severe congestion. 20.2 If we are unable to perform our obligations to you as a result of any event outside our control we will contact you as soon as reasonably possible and our obligations to you shall be suspended for the duration of the event outside our control. If this affects our delivery of products to you, we will arrange a new delivery date with you as soon as we are able to confirm this. 22.1 We may transfer our rights and obligations under any contract with you to another organisation, but this will not affect your rights under these terms and conditions. 22.2 You may only transfer your rights or your obligations under these terms and conditions to another person or entity if we agree in writing. If you are a consumer and have purchased the products as a gift, you may transfer the benefit of our warranty in clause 16.1 to the recipient of the gift without needing to ask our consent. 22.3 The contract for the purchase of the products is between you and us. No other person shall have any rights to enforce any of its terms. However, the recipient of your gift of products will have the benefit of our warranty at clause 16.1, but their consent is not required to cancel or make any changes to these terms and	conditions. 22.4 Each clause of these terms and conditions are separate and if any court or relevant authority decides that any of them are unlawful or unenforceable, the other clauses will remain in full force and effect. 22.5 If we do not insist that you perform any of your obligations under these terms and conditions, or where we do not enforce or delay enforcing our rights, that will not mean that we have waived our rights nor that you do not have to comply with those obligations. If we do waive a default by you, we will only do so in	writing, and that will not mean that we will automatically waive any later default by you. 22.6 These terms and conditions are governed by English law. 22.7 If you are a consumer it is agreed that the English courts shall have non-exclusive jurisdiction to deal with any dispute or claim arising out of or in connection with any product or these terms and conditions. If you are a consumer resident in Northern Ireland you may also bring proceedings in Northern Ireland, and if you are a consumer resident in Scotland, you may also bring proceedings in Scotland. 22.8 If you are a business it is agreed that the English courts shall have exclusive jurisdiction to deal with any dispute or claim (including non-contractual disputes or claims) arising out of or in connection with a contract, its formation or any product or other subject matter.